With over 30 years success, countless awards and over 65,000 happy UK customers, Riverford Franchise is now the UK's leading Organic Food Business. Pass on your passion to your customers and grow a Organic Food Business that you can really call your own. Riverford is different – it's not just about the money. It is all about people and food - especially their shared passion for growing and eating fresh, seasonal, organic food. The Riverford Franchise is showing sustained year-on-year growth in delivery numbers, is a multi-award winning business and a full member of the BFA. Riverford Franchisees are brand ambassadors across the country; building relationships with, and delivering to, thousands of loyal customers each week. You could become a Riverford Franchise owner from £30,000. More than 30 years ago, tired of the way the big supermarkets were treating their smaller suppliers, Riverford's founder, Guy Watson, set out to sell his ethically grown organic food to as many people as possible. 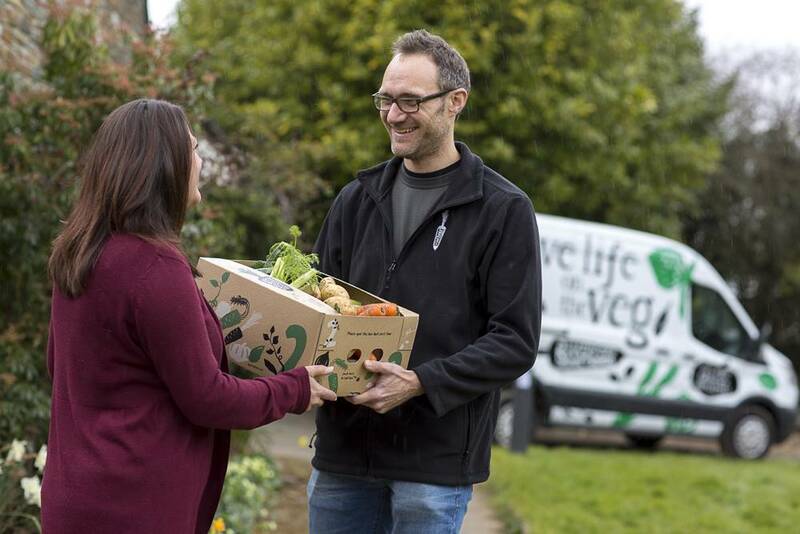 Starting with just a handful of customers (actually friends he coerced, who then became customers) living close to the family-owned farm in Devon, Guy's home delivery vegbox scheme quickly caught on. With the rapid success of his novel fledgling business came a challenge: how to expand beyond ‘one man and a wheelbarrow’, maintain a strong ethical focus and not compromise on the quality of the produce. The answer was to offer like-minded people the chance to join the company as franchisees. Fast forward 30 years from Riverford's inception and, today, the Riverford Franchise company has a dedicated network of 56 Organic Food Business owners delivering tasty, seasonal organic produce to around 50,000 homes each week. Riverford is now the UK's leading home delivery vegbox scheme, and grows most of its own produce. As Riverford has grown so has their product range. Fresh, seasonal organic veg is still their mainstay, but they're constantly sourcing new products from other artisan organic suppliers and have their own Butchery, Farm Shops and Dairy. Aside from the fruit & veg, they offer an extensive range of RSPCA award-winning organic meat; scrumptious organic cheese, pickles, chutneys and cooks' ingredients; a cooked picnic range; quality dairy produce and much more. The full Riverford Franchise product range offers a heady mix to the discerning and ethical eater, and of course gives a major boost to the Riverford Franchise owners' turnover. And bottom line profit. The Riverford approach is simple: they grow (or source), harvest and pack the produce, and transport it to your hub; you collect and deliver it to your customers. With your marketing hat on (and lots of help from the Riverford Franchise), you will increase the number of new customers starting life with a vegbox each week. Then you'll keep them loyal to you and Riverford by delivering exceptional, personal customer service, and engaging them fully with your Organic Food Business – all the way from Riverford's fields to their plates. Whilst you are using your local knowledge and expertise to become the Riverford brand ambassador within your Organic Food Business territory, the Riverford Franchise will look after the farming, hub logistics and brand marketing in the background. It’s this harmonious balance between the macro and the micro, and a genuine passion for real food, good farming and ethical business that has enabled Riverford to flourish for nearly three decades. Your focus will be to build and maintain a strong, engaged customer base loyal to you and Riverford, and the dedicated Riverford Franchise head office teams will support you all the way. Yes, but it's fun! You will get out of it what you put in. It's not rocket science but you really have to believe in what Riverford do to grow your Organic Food Business and reap the best rewards. The most successful Riverford Franchise owners have built their Organic Food Business from scratch to achieve a turnover of over £1million a year. Franchisees of these bigger businesses tend to take more of a managerial role, but they like to keep their hand in at the coalface (i.e. on delivery rounds) by covering for their drivers' holidays. Some simply want to get out on the road occasionally to have a face-to-face chat with their customers and keep their finger on the pulse. Riverford Franchise owners in smaller territories tend to work alone or as a couple - ‘owner-drivers' - whilst they get their Organic Food Business off the ground. As the number of deliveries per week increase over time, they take on drivers or admin staff to help. What's a normal day like? Early starts are the norm when you are out delivering; the days are quite long and there's plenty of fresh air and exercise, come rain, snow or shine. Riverford pride themselves in seeing their deliveries to the door no matter what! This sort of thing distinguishes Riverford from the competition. When you get back home or to your office, you'll need to complete some admin such as order processing, end of day banking, marketing, account management and answering customer's queries. In the spring and summer, you'll be out at shows and local events at weekends, finding new customers and strengthening relationships with your existing customers. In short, you'll be wearing many different hats to grow your Riverford Franchise business. Starting anything new is daunting, especially your own business. But you’re never alone as a Riverford Franchise owner. All Riverford Franchise owners are handpicked via an intensive recruitment system to make sure you are well suited to your franchise territory. During this process, you will be encouraged to fully discover what life as a Riverford Franchise owner is like, and Riverford will help you compile comprehensive business plans to deliver your growth strategy. The Riverford Franchise professional head office team will advise you how to research and set up the infrastructure to trade your Organic Food Business, and steer you through the legal process of buying a business. Before you launch, you will receive comprehensive training to help you maximise every opportunity in your new Organic Food Business venture. Riverford covers everything from proven strategies for growth, business & marketing planning, and analyzing your customer database, to how to use Riverford's bespoke round management & order processing systems and face-to-face-sales techniques. Once you are in place, the Riverford Franchise team will ensure you have the full support of their central teams for your first few critical weeks. After that, the Riverford Franchise regional sales development managers will work with you to help you deliver your business plan effectively, and to achieve your growth targets. When you buy a Riverford Franchise territory, you are buying the exclusive rights to trade under the Riverford brand identity, and via the established Riverford Organic Food Business model. Riverford has a number of resale territories available around the country. These are established territories with a certified trading history and active customer base. The investment level will therefore vary according to location, delivery numbers and turnover. A list of available Riverford territories can be found under the ‘resales’ tab. Prices are exclusive of Riverford's launch set up, marketing and training fee. Find out more about the Riverford Franchise, the leading Organic Food Business. Click the below now!